One underachieving team to another, the Indianapolis Colts yearned for this kind of "feel good" victory Sunday. The Buffalo Bills and their NFL-worst offense obliged as the obvious lesser of two 2-5 teams as the Colts snapped a four-game losing streak in a 37-5 rout at Lucas Oil Stadium. 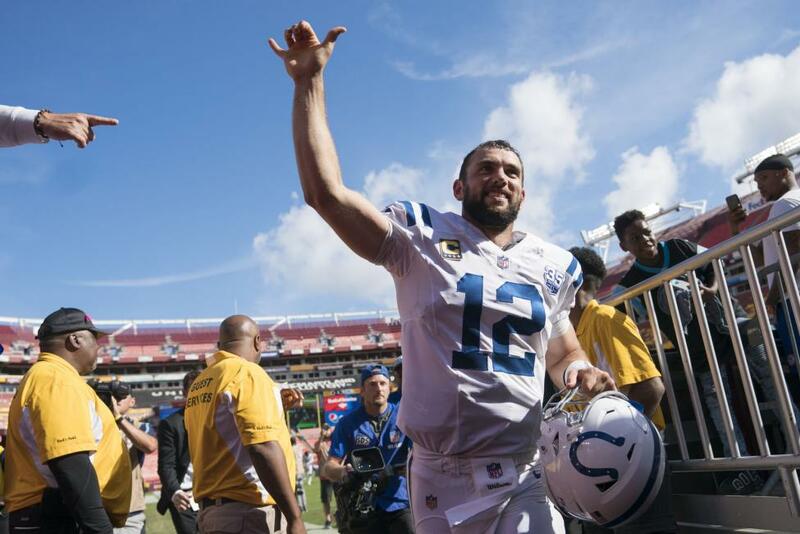 "Our team needed to feel a game like this," Colts quarterback Andrew Luck said, "to understand what it can be like when we take care of the little things and just do the routine well and do the simple well." The Colts enjoyed their largest margin of victory in 84 games, dating to a 37-3 road rout of Jacksonville on Sept. 29, 2013. A week after committing four turnovers in a road loss to the New York Jets, the Colts' offense didn't give it away while the Bills lost two fumbles and three interceptions. "We keep getting better," Colts first-year coach Frank Reich said. "We haven't played as well as we did today, so we'll just be thankful that we played the way we did today and build off of this today." In both Colts' wins this season, a defense that began Sunday ranked 30th at 30 points allowed per game didn't allow an offensive touchdown. The other time was a 21-9 victory at Washington in Week 2. The stingy effort was led by an unlikely star in safety Mike Mitchell, who two weeks after being signed off the street had an interception, forced fumble, seven tackles and two passes defended. "This has been one of the hardest-working groups I've been around, and I've only been here 13 days, maybe," said Mitchell, a 10th-year pro. "It's a hard-working group. We're very young, but being young isn't an excuse." Rookie linebacker Darius Leonard, the NFL's leading tackler, made a game-high 17 tackles to boost his season total to 79. The Bills, turning to their third quarterback in 35-year-old journeyman Derek Anderson, lived up to their offensively challenged reputation in more ways than one. The Colts scored six more points than the Bills have put up in their last four games combined (31). And two of the points scored were a gift on a Colts snap miscommunication that resulted in a safety. "We didn't get the job done today," said Bills second-year coach Sean McDermott, "and that starts with me." Anderson, who was signed two weeks ago and hadn't started a game since 2016, dropped to 20-28 in his career as a starter after losing one of two fumbles on a strip sack and being intercepted three times. "I expect better out of myself," said Anderson, who completed 20 of 31 passes for 175 yards. "I know this team is going to work hard and learn from our mistakes." But some lessons are taking quite some time to learn. In the Bills' five losses this season, they've been outscored 104-6 by halftime. The Colts led 24-0 at halftime with all of those points coming in the second quarter as Luck threw touchdown passes to tight end Erik Swoope, running back Marlon Mack and wide receiver T.Y. Hilton. "We couldn't stop anything, we couldn't do anything," Bills safety Micah Hyde said. "Just one of those games that just snowballs and everything got worse. We just got beat in all phases." After falling behind early in the second quarter on the TD pass to Swoope, the Bills drove back into Colts territory to the 22. Anderson completed a 9-yard pass to tight end Charles Clay, but he fumbled after a timely hit by Mitchell and Leonard recovered. "That was a pivotal moment in the game," McDermott said. That it came so early in a blowout was rather telling. After Luck had carried the Colts for weeks with record-shattering numbers in pass attempts and completions, he handed the ball off this day to Mack, a second-year pro who enjoyed his first career 100-yard rushing game with 126 yards on 19 carries. Mack finished the scoring with a 20-yard TD run in the final quarter. "I wouldn't say coming out party, it's just something to build upon," said Mack, who had missed four games with injuries before returning last week, "The o-line and us coming together and working hard." It is only the fourth time in Luck's 77-game, regular-season career that he's had a 100-yard rusher. While Luck was an efficient 17-of-23 passing for 156 yards and four scores, the Colts finished with 220 rushing yards. That's the most since Sept. 30, 2007, when Luck was a senior in high school. "It was a joy to watch," Luck said of the ground game. "It was fun." Every time Luck came to the sideline in the second half, he kept pushing Reich to keep running the ball. Reich gushed about his offensive line, which opened holes in the run game but also didn't allow Luck to be sacked for a second consecutive contest. That trend coincides with left tackle Anthony Castonzo's return from a hamstring injury that had sidelined him throughout preseason and the first five games. Castonzo said his offensive line wouldn't take any credit for their solid work, but they might demand a free dinner. "I'm sure they'd be happy to do that for us anyways," he said. The Bills hoped to make life easier for Anderson by relying on the run, but six-time Pro Bowl running back LeSean McCoy gained one yard on two carries before exiting in the first quarter with a head injury. Backup Chris Ivory ran for 81 yards on 16 carries, but almost every time the Bills were in ideal scoring position, something bad happened. "We've got to hit the reset button and go look at the film and learn from it," McDermott said. "The minute losing gets easy and is easy to take is not what I'm looking for. It's got to hurt." The Colts will try to start a winning streak next Sunday at Oakland (1-5). The Bills host the New England Patriots (5-2) on Monday night.